How best to pitch The Black Heart Procession to the absolute beginner? Do we prefix their wondrously intoxicating music with adjectives like ‘noir’ or ‘bewitching’? Do we dress their neo-gothic folksy indie up as The Next Big thing for the sake of a single feature piece? No, and no again: the only way to truly get a proper sense of the sound these Californians conjure so very magically is to hear it for yourself. You’re in luck: the band’s fifth studio album, the appropriately titled The Spell (for it will have you under its, um, spell, with ease), is out now through Touch And Go. 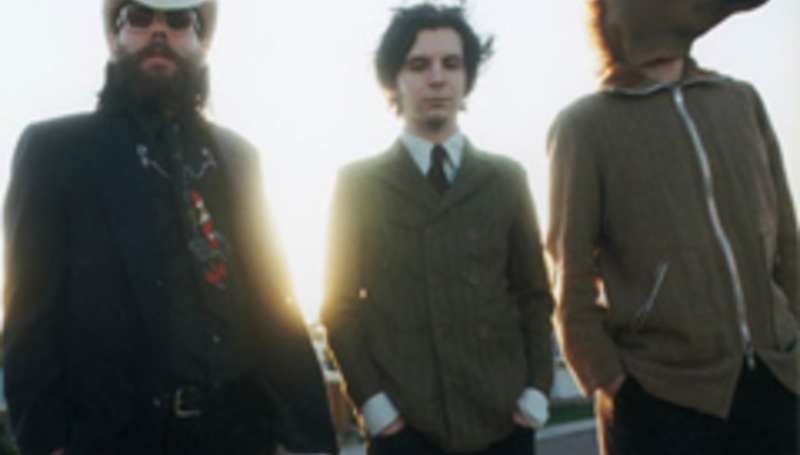 Formed back in 1997, The Black Heart Procession began as a two-piece: Pall Jenkins and Tobias Nathaniel. The pair occasionally perform together without their extended musical family (which includes Modest Mouse’s Joe Plummer and a members of The Album Leaf), as they do just a day before DiS meets them in a central London bar. It’s the first properly sunny day of the year, yet we’re hidden in the bowels of a fashionable back-street boozer. Somehow it seems appropriate – there’s very little in the way of light spread across The Spell. It’s a dark, passionate and menacing record, one that truly does entrance the listener, sucking them in so deep that few other albums register for some weeks. It’s the bottle within which the genie resides, all silken and soft but with no little suggestion of underlying evil. DiS hasn’t bothered to order a drink – we get the feeling that neither us nor Jenkins and Nathaniel are entirely comfortable in these surroundings. Loud music – the latest Yeah Yeah Yeahs record and Sufjan Stevens’ Illinois – blares from speakers hidden someplace so we can’t seek shelter from them; a waitress shimmies by, collecting empties from our table, with zero regard for the tape recorder blinking red. DiS grits its wonky teeth and gets on with business the best it can. Okay, The Spell has come out some four years after your previous album, Amore Del Tropico. Why the long wait? Nathaniel: Well, we’d basically gone from our first record (the band’s first three albums were numbered numerically) through to Amore pretty much straight, touring and making more records… and suddenly it’s seven years. So we just needed a bit of a break, and I got married and moved from San Diego to Portland, so… A little bit of light got injected. This record, in the end, took us just over a year. The difficulty came because I had to travel down to San Diego. So is this the first time the pair of you have worked apart, basically? Jenkins: We also moved the studio that we had downtown, so that took a while to set up. And did the writing process take any longer at all this time around? Jenkins: No, not really. It seemed to come in a similar way, but we kind of purposefully made this record more as a band, with all the members together, while previous albums was all me and Toby. But we didn’t take any extra time to write or record – it was the other things that kind of delayed it. And now that the new studio’s in place, do you think there’ll be a short length of time between The Spell and its follow-up? Nathaniel: I dunno… this one’s not even released yet! (Well, it is now.) So we’re just trying to focus on touring and supporting this record, and then we’ll see what happens with the next one. Jenkins: I would probably say so, though, in a certain sense. Hopefully we’ll get up to more of a… well, not a three-year gap, y’know. I hope not, jeeeez. Nathaniel: Yeah, I don’t think the next one will take so long, there won’t be such a long gap. But I think this gap was necessary. Did you spend much time between these two records touring? Jenkins: We toured a bit, but we worked on other projects – like he said, he moved. Y’know, I record bands, too, so I was involved with that and other things, so we kept busy. We would do little tours here and there, but nothing major. Nathaniel: We did two mini tours, one of Europe and one of the States, then we did some offshoot stuff here and there. So do you have touring commitments already, for this record? You had the showcase last night, and then you’re back for ATP, but what’s beyond that? Nathaniel: Well, we have about a month off between this – we get home tomorrow – and the serious touring. We’re coming to Europe and the UK for about a month and then back home. We have a week off, and then we’re doing the US. So yeah, we’ll be doing a lot for the rest of the year. There are no other UK dates around ATP – we’re flying over from Germany, and then flying back. Jenkins And I think we’re only playing London when we come back (in June), right? We might be playing one or two other shows, but we’re doing two nights at Koko with A Silver Mt Zion. And you’ve done ATP before? Nathaniel: Yeah, this would be our fourth time if Pall didn’t get sick. Jenkins: I got sick on one of ‘em, so we didn’t come, and then we played twice in America, and now we’re gonna do this one. Jenkins: And there’s a ‘5’ on the CD. Oh really? Y’see, there’s me looking at the cover while the CD’s playing… but why did you stop naming your albums in such a fashion? Jenkins: Well, we did the first three albums up at Bear Creek, and we started making Amore in our own studio, so it became more of a conceptual record, feeling-wise. And we made a DVD, too, with fourteen videos – it was a murder mystery – so we felt it needed a title. And we only originally planned to do number one, but we kept doing it, and by the time four came out we thought we’d better stop. Although this album was written as a band, do you think the pair of you will return to writing as a duo, considering the commitments of other band members? Jenkins: I think we probably will, as it’s a way to keep things fresh, but also these people that we’ve been playing and touring with, it’s good to have them vested in the making of a record. Y’know, we’ve developed as band but also we’ve enjoyed this tour as a two-piece, and we’ve been having a really great time. Do you often get to play as a two-piece these days, back home? Jenkins: Not so often anymore. Nathaniel: We used to a lot. On the first three records we would do weeks… I think on the third record we toured with Blonde Redhead as a two-piece. But the first two records, for sure, were toured with just he and I. It’s super-fun to do it again now, as it reminds us of where we came from. If you don’t play as a duo for a while, are you more aware of the precise part each other plays? Nathaniel: We have more control when we do it this way. When I play the piano when we’re a two-piece, I can be more dynamic. Otherwise I’m just banging away and making sure it’s coming out in the mix. But also we write songs differently as a two-piece, and with this record it was meant to be a band effort. Jenkins: Definitely. I think with each record, we try to make them like a journey of sorts, like reading a book or seeing a movie. The last one was a little bit more obvious in that direction, but we really do think about sequencing and artwork, and the whole idea of the record instead of one song or one style. Each is a mixture of flavours, and I think this record did come out a bit darker, and a bit more sinister, with the idea of The Spell. To me it tangles and ties ideas of politics and war, and you can read into in that way, if you think about, or you can look into it as a collection of love songs. DiS, however, is of a slightly different opinion: The Spell isn’t a record that can be read by an individual, based on their wishes; rather, it’s a force unto itself, a living, breathing manifestation of a muddle of emotions that’s potent enough to influence the listener into a specific mood, not the other way around. It’s a sensual listen, each casual stroke of finger and thumb on string and drum akin to a single digit running the length of a spine, every half-inch spreading infectious tingles from shoulder blade to cuticle, from kneecap to big toe. In short, The Spell is a record that cannot be described, that cannot be assessed, by a single mind. So, listen without prejudice, dear reader, as any assumptions or expectations are only ripe for a dashing. The Spell, and the single 'Not Just Words', are out NOW through Touch And Go.